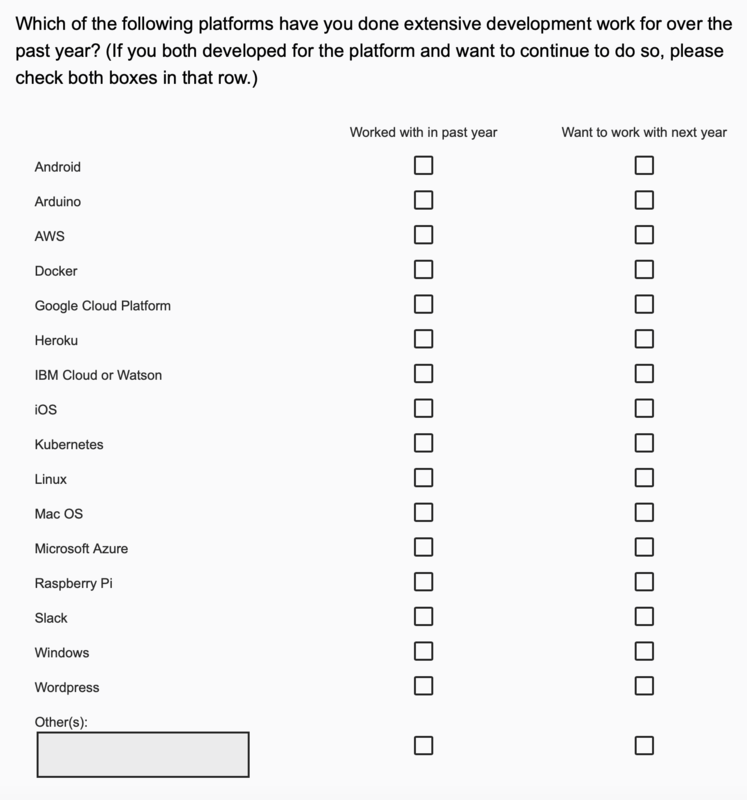 Our annual survey, now in its ninth year, launches today and anyone who codes is encouraged to participate. The survey will be open until February 12. We heard you loud and clear when you asked for a shorter survey. We did our best to deliver without sacrificing valuable insight, and we shaved off about five minutes from last year’s survey. The survey should take about 25 minutes to complete. Any user who completes the survey in its entirety will have the option to get the Census badge on Stack Overflow or a different technical site in the Stack Exchange network. Thanks in advance for your time and thoughtfulness. If you use security or ad-blocking plugins, you may see error messages Our third-party software provider, Qualtrics, does not work well with certain ad blockers and security software. To avoid error messages that prevent you from taking the survey, please try specifically unblocking Qualtrics in your plugin or pausing the plugin while you take the survey. Would you like to see any of the following on Stack Overflow? Check all that apply. Please no. It already exists on LinkedIn and it feels more like a PR campaign and spam than anything else. These companies can already provide that information in the job offers. To provide them with a new way of getting information fed to us, would be in my opinion bad. StackOverflow should not expand into this. It should stick to what it does best; offer a professional Q&A site. How do you feel about the quality of open source software (OSS)? I don't think this is a good question for the survey, personally. Each piece of software, each library, each app is so wildly different from the next and written by so many different authors that you can't begin to average them meaningfully this way. Further, the nature of proprietary/closed-source software makes it harder to compare quality as you typically only see the front end interface of such software... you don't know how well it is written, whether that is efficiency, elegance, or some other metric. Has two "no" options, but each one includes a strong opinion, either 'I'm glad this is the case' or 'I wish this were the case'. Where are the options for "No, and I don't really care one way or the other"? I would prefer if you could insert a "No opinion" option for these types of questions, at least in the future. Or make it clear that you can leave it blank... which reminds that these radio button questions also need a way to clear the selection; going back and then moving forward again doesn't clear a question's choices, and once you've finished a section it seems like you aren't able to go back and change your answer. It looks like this ban is country-based and it is inaccessible for Iranian users. Because when I switched to VPN, I got no such message. Thank you all for the support and care about unjust issues like this. Apparently, the ban has now been lifted up. I was able to visit the survey page from three different locations without any problems, and got my Census badge just now. I would like the other users who are still unable to access the page, to leave a comment or inform the SO staff. Imagine that you are deciding between two job offers with the same compensation, benefits, and location. Of the following factors, which 3 are MOST important to you? Family friendliness (such as providing child care options, financial support for Kindergarten etc. )is not listed but should be considered an important factor at least to me this is a top priority. You have either already completed the survey or your session has expired. It would make more sense to simply remove this bar for those who have already completed the survey. Think back to the last time you solved a coding problem using Stack Overflow, as well as the last time you solved a problem using a different resource. Which was faster? The problems can be different requiring different implementation efforts after looking at a resource. Also faster is quite subjective. Faster what? 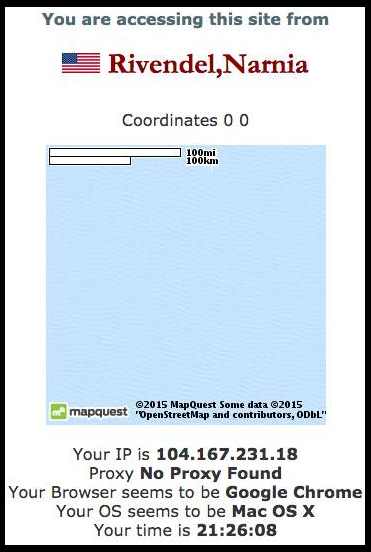 Coding, searching or something else? Why have you included WhatsApp, a messaging app, in a list of social media sites? Surely you should then also include SMS, phone calls, and letters. Semaphore flags. Smoke signals. You get my point. A large group of people visit Stack Overflow to curate the content, and to moderate the site. This question seems to be missing them. Would it be possible to add a "Moderate the content of Stack Overflow" as an option? Think back to the last time you updated your resumé, CV, or an online profile on a job site. What is the PRIMARY reason that you did so? I just like to regularly keep my CV up to date, why is there no 'other' or 'just because' reason for this? Also, clicking a radio button here makes me unable to 'deselect' it and press 'next' without choosing anything. Which of the following platforms have you done extensive development work for over the past year? (If you both developed for the platform and want to continue to do so, please check both boxes in that row. Does Slack qualify as a development platform? Seems to me it's a sneaky way of recruiting former Slack developers ;). In "current total compensation" question, how do I specify which of "weekly, monthly, or yearly" it is? It doesn't let me enter anything but numbers in the input field. In which city or town do you live? This information will be kept private. Why do you care? I expect to read the 'why' here or in the survey results. the company (WPP) which is controlling my company is ~130.000 employees. Which range I had to choose? Instinctively I chose the second option because it represents the set of people with whom I interact more or less habitually for work (and that name is on my paycheck), but I'm not sure if it's the right answer or not. As for conversation I am not preferring any other other, either is useful depending on situation (didn't choose anything). I used the link in the banner. Were my responses actually recorded? Didn't quite understand the objective of this question. In generic sense, of course every individual knows what they're doing. But how am I suppose to guess and answer whether my manager really knows what he/she is doing or just pretending? So, Wordpress is a platform but Drupal is a framework? Where does Joomla belong? Why not just merge all these "trending technology" questions into an interactive one and only categorize them in the report, if ultimately needed? Also, I can't add more than one "Other" technology, which will lead to completely distorted results. About how much time did you save? If you're not sure, please use your best estimate. The question asks how much time I saved using Stackoverflow against another scenario. But it is not clear if that other scenario is solving the problem using a different resource or if the scenario is trying to build the solution myself. One of the questions asked how confident I am in my skills as a developer (below average / average / etc). I think an interesting follow up question would be to ask "why?". On average, how many hours per week do you spend on code review? Will this be calculated against the amount of hours I work per week, multiple questions earlier? If not, this question should ask for a percentage instead. It looks like pressing tab out of the survey questions focuses on the back button, not on the next button, which is unintuitive and unhelpful. And lists blindness, hearing etc. And then (unless I'm mistaken), it repeats the question (with the exact same wording) but lists other conditions about mental/learning differences. I came very close to putting one of the second set of options (e.g. Anxiety) as my 'other' to the first, before I saw both questions. Could they be numbered, or more specific? Would it be interesting to have a question about the (coffee / energy drink) consumption of (users / developer / IT worker) in the survey? I think I am not alone who answered what? for this question. A couple of thoughts on questions. Questions about code reviews should also include options for workplaces where they are required by the company either for general policies or for industry requirements. I know in the financial industry more weight is put on a code review because of the potential impact malicious code can have on finances and I am sure there are other industries like this. Also for unit testing it might be good to include options for places where it was not required in the past but they are slowly adopting it for new code and none of the answers provided really seem to fit that situation. 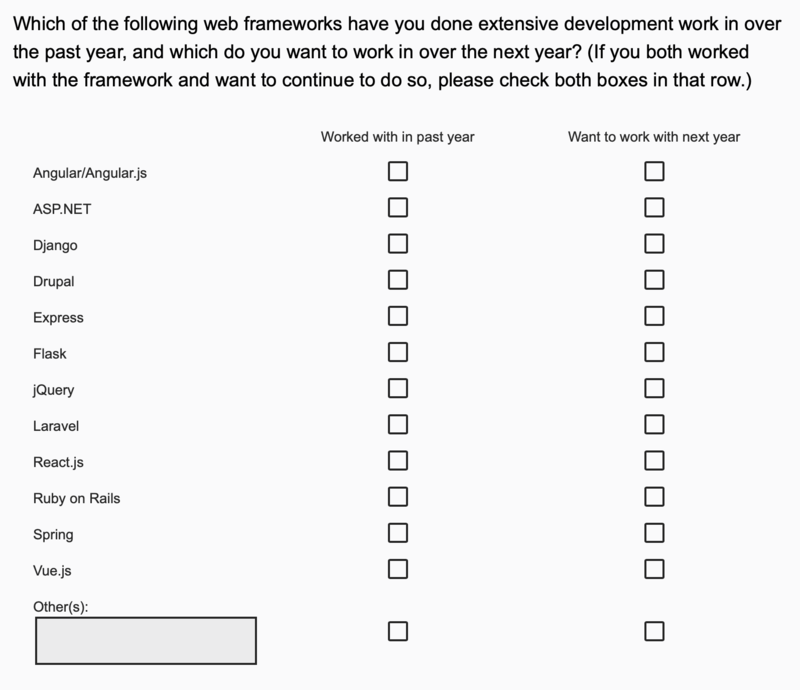 Out of curiosity, on a lot of the frameworks questions, how would you distinguish between me choosing not to respond and my not working with any of them? I personally don't do any web development and don't particularly care to (I am a low level driver type) so pretty much all my work is in C/C++, and I have no desire to branch out (in that direction anyways). 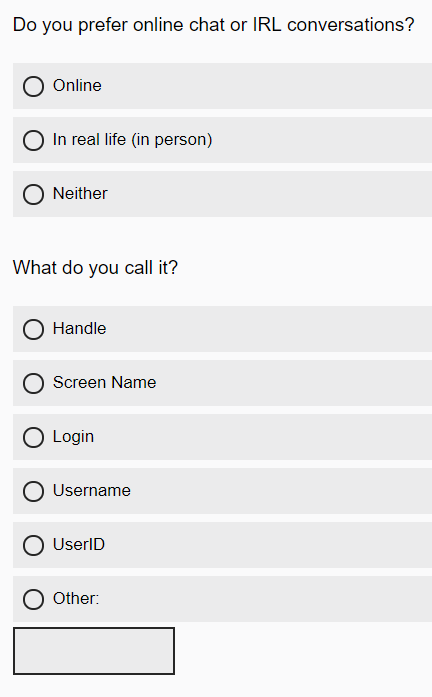 There isn't a "None of the above" option, and the question isn't required. Regarding the music playlist: I believe that that is a wonderful idea, however since taste in music is vastly different between people and different styles work for different people the best way to go about this would be to integrate pandora.com into your website and make it accessible for people not living in the USA. Their music genome project is really a good - if not perfect - way of classifying music. Obviously the algorithm selecting music for a station would have to be a bit more conservative than what they use on their website. I'm guessing that the downvotes are due to me mentioning a specific site. Before downvoting, please read up on the music genome project. IMO it is vastly superior to any other music finding algorithm out there when it comes to finding (completely) different music that is surprisingly enjoyable even though it sometimes is on the opposite side of genres than what one started out with. Anecdotal evidence: I started out with Slipknot and Rammstein and somehow found myself listening to classical music a month later. I never thought I would enjoy that type of music. Turns out I was wrong. Not the answer you're looking for? Browse other questions tagged discussion survey survey-2019 .